PhishAlert sounds like a useful application that will protect you against phishing websites, but we have found that, in reality, this is a simple ad-supported application that may indirectly cause harm to your system security. This is an unreliable program that runs in the background and may start to show you potentially unreliable third-party advertisements. Although it may not be as dangerous as a Trojan or a Rootkit would be, keeping this adware on your computer may still cause just enough headaches for you to make you want to step up against it in time. That is why we recommend that you remove PhishAlert before it is too late and you infect your computer even more, which might result in damage to your operating system beyond repair. Please continue reading our article if you want to know more about this infection and how you can protect your PC against similar attacks. As a matter of fact, we have found that this malware has no official or promotional website. What’s more, it seems that this adware was only spread on the web for a couple of days. Of course, that does not mean that a new campaign cannot start up any time in the near future. Since there is no website where you could download a standalone installer, it is most likely to be distributed in freeware bundles. If PhishAlert shows up on your system, it could be an indication of your visiting questionable file-sharing websites as infected software packages are mostly hosted on such pages. It is enough to click on a misleading advertisement and you may infect your machine with a whole bunch of malware. But, even if you download such a bundle, you may still be able to save the day by opting out of the installation of certain contents of the package. If you ignore that major step in the installation wizard, you will have to face a number of security threats that may start running amok on your operating system and cause serious damage if not controlled or removed. The best thing to do if you are uncertain about the infection level of your system is to delete PhishAlert and run a free online malware scan to find all the “baddies” on board. This adware does not even have a graphical user interface, it simply runs as a process in the background, so you have no idea what it can or may do in reality. It is one thing that it may display questionable third-party ads to generate traffic to certain websites thus generate money for its creators. What may be even worse, this adware might also be able to compromise legitimate third-party ads on otherwise legitimate websites. For example, if you are on a YouTube page and see a relevant ad, you click on it and you might get redirected to a malicious website. If that ever happens to you, you should immediately scan your system for malware. If you do not have any tools for that or do not want to use an online tool, you can still check the installed programs list in Control Panel, or the extension lists in your browsers to see if there is any application or tool that you do not remember installing. If you find PhishAlert, you should not hesitate to remove it. It is time that we talk about the solution as well. 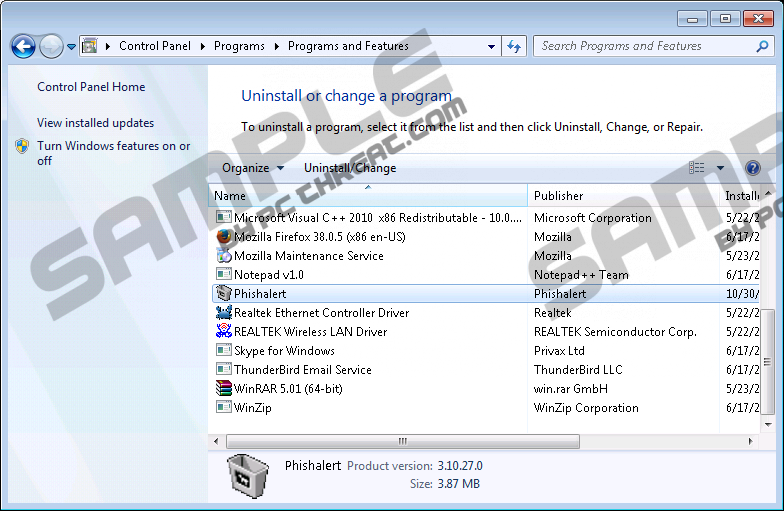 Fortunately, this adware has a working uninstaller, which makes it quite simple to uninstall it through Control Panel. It is possible that you have never done that before, so we have included step-by-step instructions for your assistance. But, if you need powerful protection against all known threats, we suggest that you use a malware removal program to take care of all the security issues instead of you. Also, it is important to note that you can help your system by keeping all your software and drivers updated. Press Start and go to Control Panel. Tap Win+X and open Programs and Features. Quick & tested solution for PhishAlert removal.